Get your favourite LG handsets like the LG G4 with P 5,700 worth of freebies and the LG G3 Stylus and LG Magna on slashed off prices from July 15 until August 2, 2015. 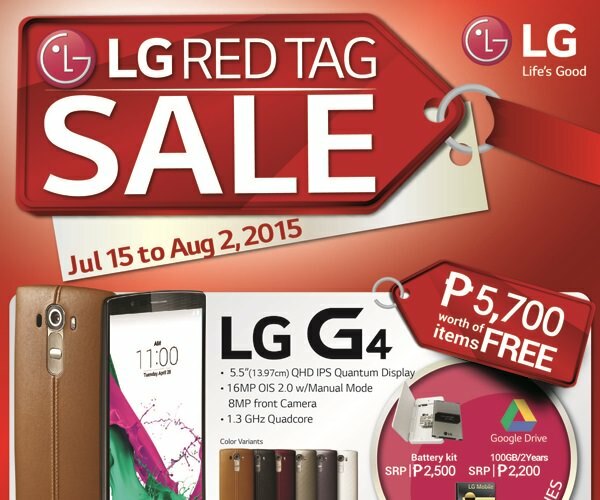 MANILA, July 22, 2015 – Technophiles are in for a treat as global technology leader LG Electronics recently announced its Red Tag Sale where gadget enthusiasts can avail of premium LG smartphones at pocket-friendly prices. Smartphone savvies can take home P 5,700 worth of freebies including a 32GB microSD card worth P 1,000 and a battery pack worth P2,500 when they purchase the great LG G4. They also get 100 GB additional Google Drive storage for an extended period of two years worth P 2,200! LG’s most ambitious smartphone to date, the LG G4 boasts an impressive 16 megapixel OIS 2.0 rear camera with ultra-wide f/1.8 lens, completely customizable settings, and remarkable Color Spectrum Sensor that can rival professional DSLR cameras in the market. Multitaskers will also rejoice at LG G4’s powerful 1.8GHz 64-bit Hexa-Core CPU, removable 3,000mAh battery, and Qualcomm® Snapdragon™ 808 processor with X10 LTE chipset that deliver lightning fast response on its stunning 5.5-inch IPS Quantum Display. For bargain hunters, LG is slashing P2,000 off on the LG G3 Stylus and LG Magna. Get the smartly designed LG G3 Stylus for only P 9,900. Scribble notes and random musings on its 5.5-inch IPS LCD capacitive touch screen with the accurate and convenient RubberdiumTM stylus pen. Enjoy the power of LG G3 Stylus’s Quad-Core processor and the convenience of having a dual SIM function and long lasting 3,000MAH removable battery. Gadget geeks can also get the LG Magna, which was just introduced in the market last summer. From P 9,990, LG Magna retails now for only P 7,990, featuring an impressive 8-megapixel rear camera and a 5-megapixel front camera and sports a 5-inch in-cell touch display with a slight curvature in its body, a feature normally found in premium smartphones. “LG has made a name for itself as a company that produces innovations that not only entertain but also become an integral part of the lives of our consumers. The Red Tag Sale is a way for us to show our appreciation to our customers by offering great deals on quality products,” said said LG Mobile Philippines vice president Jay Won. To learn more about LG’s Red Tag Sale, visit www.lg.com/ph; like LG Philippines’ Facebook page; or follow @LGPhilippines on Twitter and Instagram.